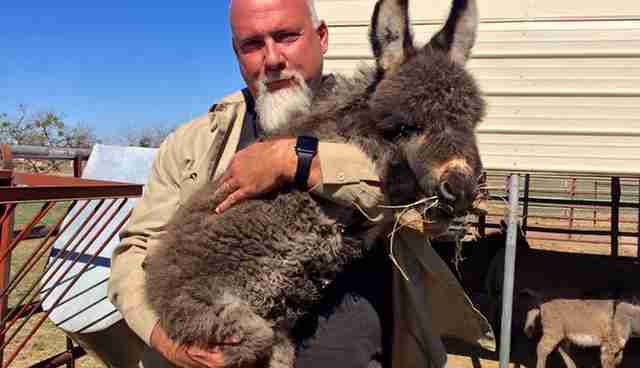 Some clueless Texas ranchers bought a dozen donkeys to breed last year, but the novelty soon wore off. And so they (rather stupidly) released the animals onto a few hundred acres of farmland. Fast forward to February and there were zillions of mini donkeys with no one to care for them. So, the people at Peaceful Valley Donkey Rescue (PVDR) did what no one else would: They took them all. The donkeys, who have been essentially living as wild animals on ranch land, will need some help adjusting. And PVDR is up to the task. The rescue organization, which is in San Angelo, Texas, called the conundrum a "breeding situation gone horribly wrong." According to the rescuers, these donkeys have never been handled, so the transition to PVDR's 172 acres was "extremely stressful." So, the people at the sanctuary are being understanding, allowing the donkeys to settle into their new environment before they begin microchipping, de-worming and vaccinations. Once the little donkeys learn to trust people again, they'll be up for adoptions - to people who will actually care about them. That's a happy ending for all. Learn how you can help Peaceful Valley Donkey Rescue here.